Thank you for your interest in one of Preferred Auto Fort Wayne State's online offerings. 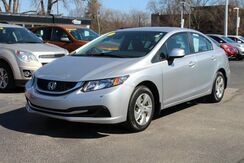 Please continue for more information regarding this 2013 Honda Civic Sdn LX. Save money at the pump with this fuel-sipping Honda Civic. For decades, the Civic has offered one of the best compact-car picks for those who want to keep their ownership costs low and plan to keep their cars a long time. The Civic is also one of the roomiest small sedans, with even better ride comfort and interior refinement this year.